NETWORK FINALS: OLYMPICS coverage jumped 0.8 to 5.5 in finals, but the special post-games SUPERSTORE fell 0.3 to 3.0, and by its final 15 minutes, it was down to 2.6. That’s still a good number for SUPERSTORE, but it’s unlikely to get near that in its regular timeslot. Elsewhere, as expected, NFL Preseason games played havoc with the ratings. All the shows on ABC, including the SHARK TANK rerun, WHAT WOULD YOU DO and 20/20, lost 0.1. On CBS, BIG BROTHER and the BLUE BLOODS rerun dropped 0.2, and the HAWAII 5-0 rerun was down 0.3. FOX’s MASTERCHEF reruns slipped 0.1. And on CW, the final episode of MY LAST DAYS fell 0.1 to a meager (even for CW) 0.1. CABLE HIGHLIGHTS: Adult Swim led a quiet night on Friday cable, with THE ERIC ANDRE SHOW up a tick to 0.48, and MDE WORLD PEACE up 0.03 to 0.38. NFL Network’s PRESEASON NFL Miami vs. Dallas game was at 0.46. On Lifetime, BRING IT dropped 0.05 to 0.42, and THE RAP GAME was down 0.07 to 0.38. A pair of Disney Channel shows hit the Top 10, with the primetime GIRL MEETS WORLD down 0.07 to 0.37, and a 9:30AM DOC MCSTUFFINS up 0.06 to 0.27 (with its lead-in PJ MASKS just out of the Top 10 at 0.25). They were joined by Cartoon Network’s 5PM AMAZING WORLD OF GUMBY at 0.29, and Nickelodeon’s 10AM MUTT & STUFF down 0.07 to 0.26. History’s ANCIENT ALIENS gained 0.07 to 0.31. 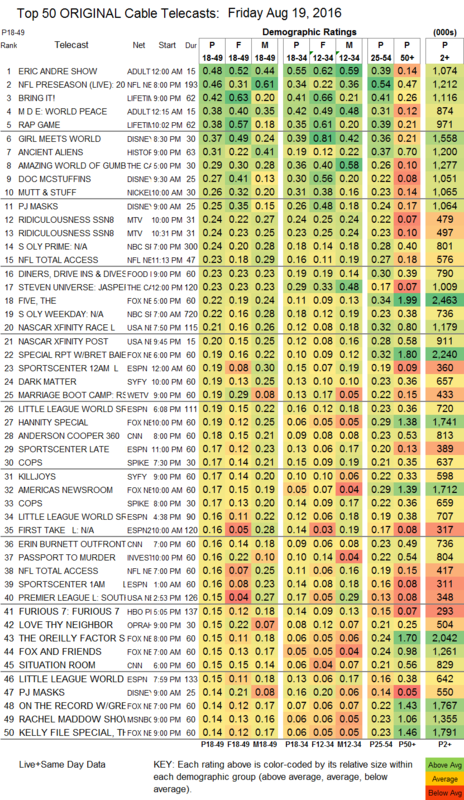 MTV’s 2 episodes of RIDICULOUSNESS were both at 0.24, compared to the 0.26-0.24 range for last week’s 4 episodes. The night’s RIO SUMMER OLYMPICS coverage peaked with NBC Sports Net’s primetime 0.24 (daytime was at 0.22), with CNBC at 0.13, USA at 0.11, MSNBC at 0.07 and Golf Channel at 0.04. Food Network’s DINERS, DRIVE-INS & DIVES ticked down to 0.23. USA’s NASCAR race was at 0.21. 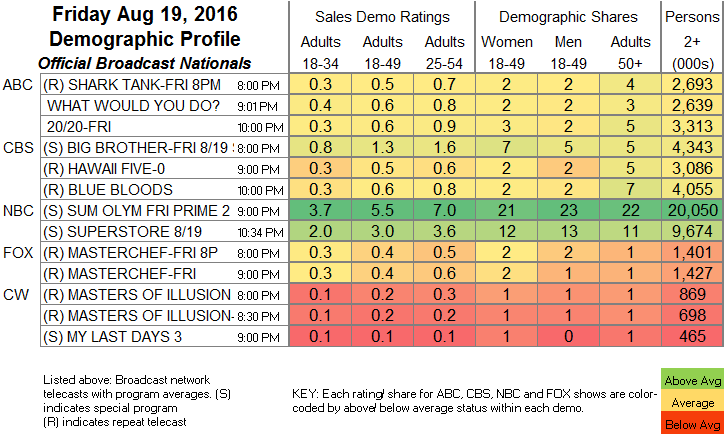 On Syfy, DARK MATTER rose 0.03 to 0.19, and KILLJOYS was down 0.01 to 0.17. We’s MARRIAGE BOOT CAMP fell a tenth to 0.19, and MILLION DOLLAR MATCHMAKER was down 0.04 to 0.13. OWN’s LOVE THY NEIGHBOR lost 0.02 to 0.15. Bravo’s REAL HOUSEWIVES OF MELBOURNE gained 0.02 to 0.09.